Travel into the heart of Australia on a Kings Canyon day trip from Ayers Rock. Your journey takes you to a classic outback cattle station at Kings Creek Station and reveals the amazing landscape of Kings Canyon. For tremendous views over the immense chasm, explore the canyon’s steep cliffs on the Rim Walk or follow an easier route along the canyon’s floor on the Creek Bed Walk. At the end of the tour, you have the option to return to Ayers Rock or continue to Alice Springs. After an early morning pickup from your Ayers Rock Resort hotel, watch as the desert comes to life on your journey across the desert to Kings Creek Station. Along the way, you might see kangaroos, camels, wild horses and dingoes. The two-hour trip brings you to the enormous Kings Creek cattle and camel station, established in 1981 and covering 1,115 square miles (1,800 square kilometers). Experience daily life in the outback cattle station, relax with breakfast and coffee in the station cafe (own expense) or take a camel ride with the station hands (optional). 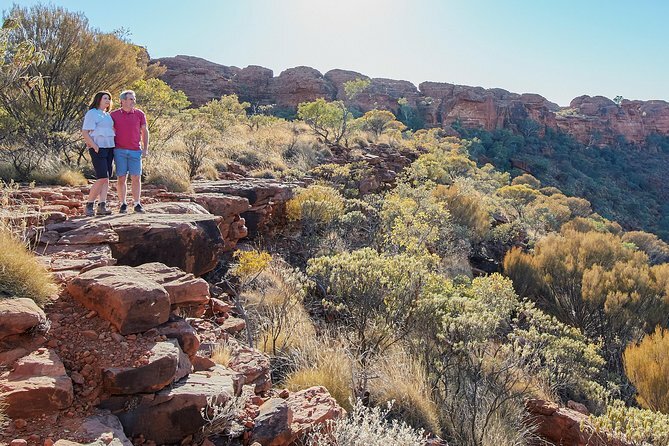 Your tour continues with a 30-minute trip to Watarrka National Park, and the amazing sight of Kings Canyon. Listen to your expert guide's commentary, and hear how the red sandstone gorge is sacred to the local Ulpinyali and Lilla people. To explore the canyon more closely, choose between the 3.5-mile (6-kilometer) Rim Walk or the easier mile-long (2-kilometer) Creek Bed Walk. The three-hour Rim Walk takes you up a 330-foot (100-meter) cliff face and along the canyon's sandstone edge, revealing magnificent views over the valley's sheer walls. Follow a steep, rocky trail into the chasm to reach the oasis known as the Garden of Eden, tucked between the sandstone cliffs. The natural spring is surrounded by a unique landscape of gum trees, palms and ferns. If you choose the more relaxing Creek Bed Walk, your leisurely stroll follows the rocky creek bed to a viewpoint of the canyon's impressive cliffs, and explores the rock-strewn valley floor. Leaving the canyon, travel to Kings Canyon Resort. Enjoy lunch (own expense), then relax in the afternoon on the return trip to Ayers Rock Resort or Alice Springs. This tour offered two options. One required climbing up 500 steps before the 3.5 hours' walk along the rim. Another option was the Kings Creek walk which last half an hour the most. The rim walk would have a better view of the canyon but you have to be well trained and fit enough to climb the steps. We took the Kings Creek walk which wasn't much to see. Of the whole tour, 7 hours was spent inside the coach.